The Texas Skunk was actually a Nevada Skunk for six years before moving to Texas. 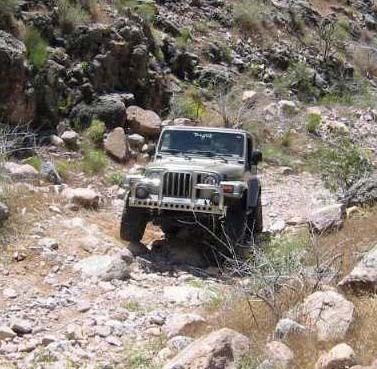 He lived in Las Vegas and belonged to back-roads exploring 4X4 club. These are some of the pictures taken during that period. My Nevada photos were lost in a major computer crash. Most of these photos are from the collections of others who were my “Trail Buddies” in Nevada. additional gas and a high lift jack. Yes, it had AC! Playing follow the leader out of a creek bed. There were also places to get wet. Joshua trees are found in many locations through out Southern Nevada. branches the unique appearance of a long bottle brush. and other potential pests. The tree’s longevity is due in part to the wood’s extreme durability. 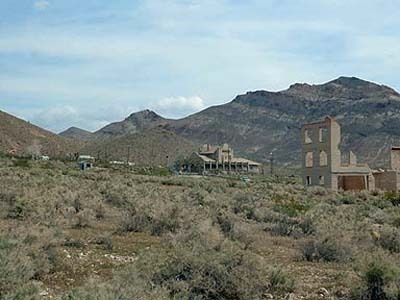 There are numerous Ghost Towns or in his case ghost cities. They sprang up when a mining operation started and closed down just as fast when the mines closed. 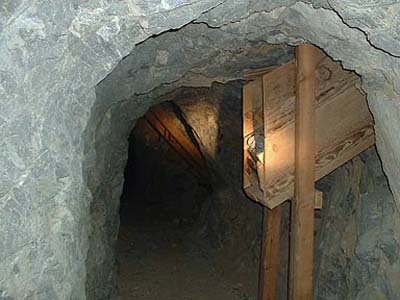 Gold, Silver, copper, lead and many other minerals are present in Nevada. 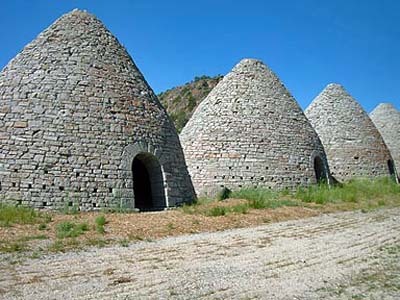 Some mines have reopened and are now reprocessing the “tailing’s” waste piles. One such mine is making expenses from the gold found and turning a nice profit with the copper that is reclaimed from the same pile. This old trailer was probably home to a prospector and his family. could only be navigated by a 4X4. Have no idea how it got there. 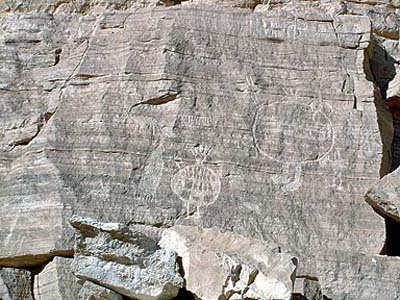 Nevada is publicly owned by the US Government. 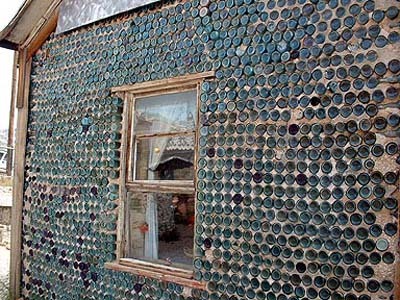 Some residences were made from whatever materials were handy. 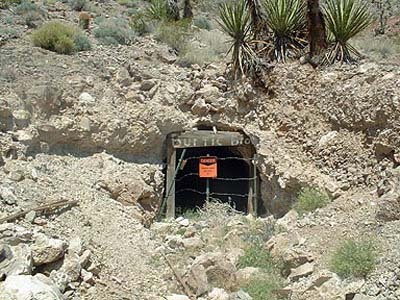 The official Government position is not to enter any mine. 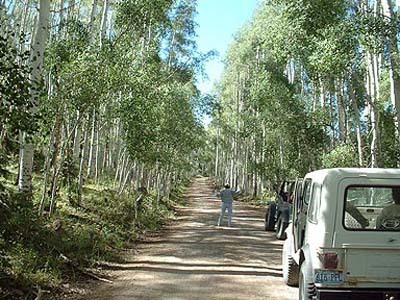 Most are located on US Government property so officially mine exploring is a no no BUT when did that ever stop anyone? You need to evaluate the mine by looking for large rock falls or evidence that the ceiling has collapsed in places. If you find that, stay out. But if the ceiling is okay and there is no evidence of any large rock falls inside, you are probably relatively safe in sticking your nose in. and the other shows evidence of a major collapse. These are photos of the interior of some mines. happens Early in the morning it will ruin your whole day! 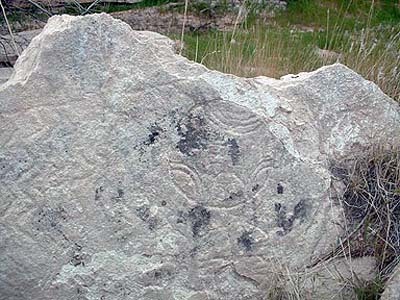 surface of the hill above it. The mine shaft itself looks sturdy. Hum, we have a snake skin from a rather large snake. And here he is. A Mojave Green rattlesnake. The Mojave Green is the most dangerous snake in the US. Their venom is comprised of both hemo and neurotoxin.Mohave Green rattlesnake has venom that is considered to be the most debilitating and potentially deadly of all North American snakes, even the coral. 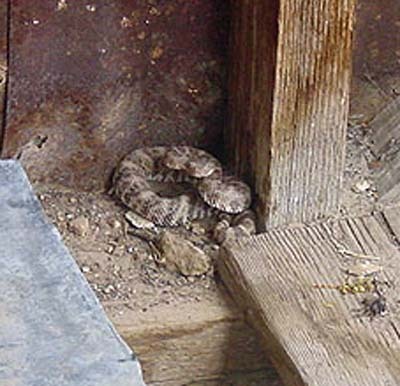 It is 10 times more toxic that the usual rattlesnake venom. Most snakes are retiring, not the Mojave Green. He can be aggressive and unpredictable. 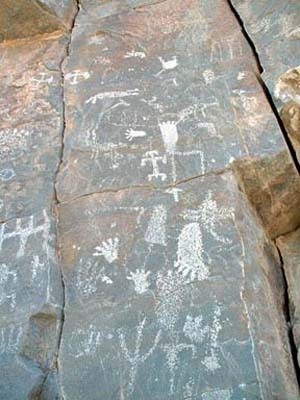 There are many Indian Pictographs in Nevada. Surprisingly few have been vandalized so they are in good shape. 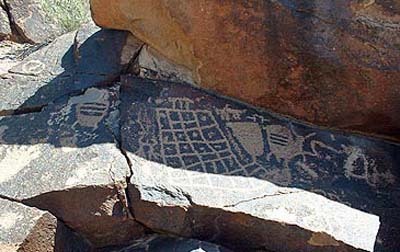 Some are merely chipped into the desert varnish, a patina that discolors rocks over a long period of time that covers most desert rock, however some are deeply engraved into the rock itself.